If Adam starts the game with Find the Truth in play, does the Runner reveal his or her starting hand to the Corp? No. The directives start the game installed, but during set up they are not active. So I agree with H0tl1ne in his/her review about Laramy Fisk, that is a pretty neat interaction. I would however like to expand the review to include the Criminal faction in general. My occasional efforts at Adam decks are usually fun but somewhat lacking (disclaimer: I have not tried Adam with this new directive at this time). The issue I continually come up against in his faction is Economy, especially when you're already spending influence on breakers. This new directive got me thinking along these lines of run-based synergy in general, and who does that best? Well, they are fairly unpopular for quite some time now, but I think nobody would disagree that Crim does econ best, especially in light of the recently released Temüjin Contract. You know what else Criminal has been struggling with, and that is having a persistent R&D threat. The Spy Camera is a neat idea, but even in Geist the card has proven to be less potent than in Shaper decks. Combine these two questions, and find your answer in this card. You know what looks especially appetizing? Play this alongside an Enhanced Vision in Silhouette. In a single Security Testing run on HQ you can expose any installed card of your choice, see what's on top of R&D, and have the Corp give you a sneak peek at HQ all at once. This much information would give Agent Mulder all the validation he might need in his weakest moments. The truth is out there, and this card will help you find it. The in-depth analysis of this card has already been done. I have but one thing to add. Basically, you can choose the order in which the triggers take place. So - FtT allows you to see the card before you decide to either force the draw or not. Is this the card that I have waited for? Or rather, does it make Fisk viable? Obviously not. Nothing ever could make Fisk viable. But good effort's good. So the obvious point here is that now that there's a fourth distinct Directive, Adam can choose one of the four to not have to start with. I'm going to be uncontroversial and suggest the best option to skip is probably Safety First, simply because it ironically makes early game runs against Jinteki (and some Weyland/HB builds) a lot more dangerous. You should probably still run Safety First though, because once you've got some other way to shore up your hand size up and running (Brain Chip?) the free draw is really strong. So the main value is in DELAYING Safety First until you're ready to deal with the downside, not getting rid of it entirely. Now, the card itself. 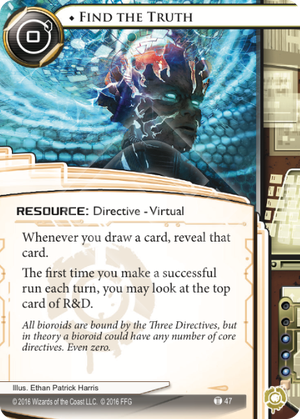 The effect is strong by itself (it's easy to see this from what other things that reveal the top card of R&D like Deep Thought require of you), and I honestly think the downside gets less nasty the better you and your opponent are at Netrunner. If your opponent is good, they'll be able to roughly guess what they need to be defending against ANYWAY based on cues in your initial turns. It's the same reason Expose is often considered a "newbie" thing: Once you get a feel for the game, you can gauge what ICE you need to be prepared to faceplant into without needing it. It does mean you can't pack any nasty surprises into your deck though, unless you work around it with "tutors" like Self-modifying Code. Or by ending the game really quickly. Put no ICE on HQ and take a large risk of losing an Agenda for almost nothing. Put two ICE on HQ and be able to put only one ICE on ONE of the other centrals, meaning the best case is probably that Adam hits an undefended Archives to reveal the top card of R&D, then has time to install breakers before going for it if he wants it. Or you can just open with The Maker's Eye. Aim to win quickly. In this case the use case is obvious: you can pick up some quick accesses early on, this directive allows you to pressure R&D automatically if you're running other servers (which you should be! ), and the downside is even mitigated because your game plan is more straightforward. Aim to win SLOWLY. In this case, your early pressure buys time for you to get established and helps to shorten the midgame by forcing the corp to commit more stuff to defending centrals rather than scoring out (or if they ignore the pressure, it gives you a good chance at a point advantage). Not starting with Safety First installed also makes it harder for you to get flatlined before you can make it to endgame, and the informational advantage of getting to see some of the cards the Corp is getting shouldn't be underestimated either. In summary, I think the main reason not to start with this card installed instead of Safety First will be if you want to surprise your opponent with something or you're playing a certain type of event-heavy deck (where the clickless draw from Safety First is so valuable that it's worth giving up the R&D pressure on offer here). Since Adam's signature console lets him snowball games (i.e. KEEP winning if he STARTS winning), a free tool to help you start winning is powerful. You COULD replace other Directives instead and in some cases this is important (Industrial Genomics: Growing Solutions makes Neutralize All Threats a huge liability, for example), but you can make this decision after seeing what your opponent's ID is! This also means you can take Safety First instead if you judge that it will be safe enough.